Ever since I got my JTM-45 clone in summer 2015, I thought perhaps the Tube Screamer from Ibanez would be a nice addition, but I somehow hadn’t been motivated enough to buy one… until last week. 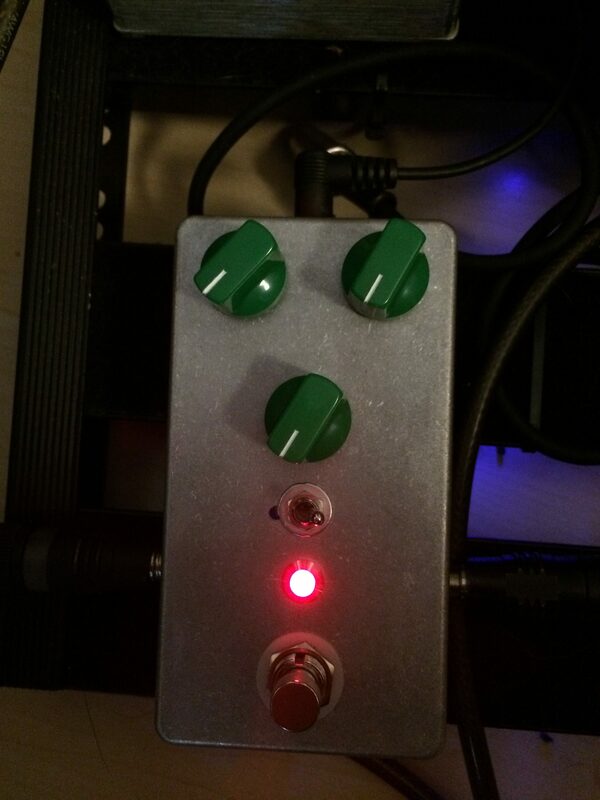 I ordered a clone, The Screamer from Das MusikDing. 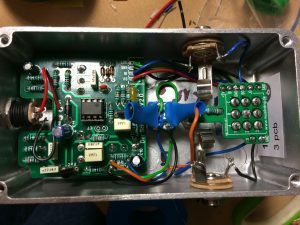 I had assembled a couple of kits from that shop before, but when I started soldering the Screamer, I was surprised about a small, but very convenient improvement over prior kits: Along with the various parts, a small PCB is being delivered. You solder the nine lugs of the footswitch to it and connect it to the input, output, LED and – of course – the main PCB. 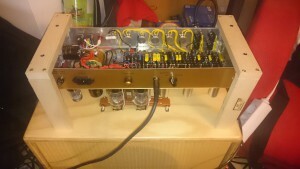 This completely removes the burden of spending an hour soldering various wires to the footswitch. Thumbs up, MusikDing! 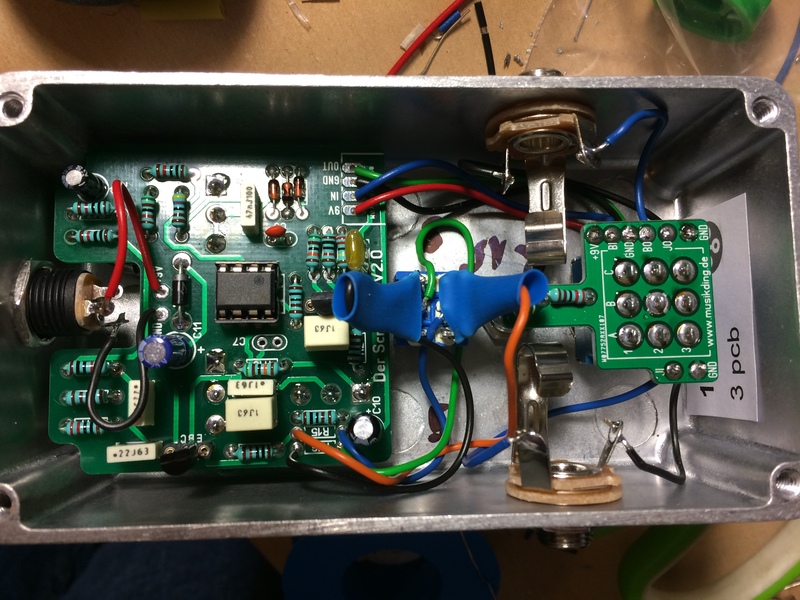 I also modified the circuit a little, making two resistores switchable, so you can choose between a TS808 and TS9 voicing. After finishing assembling the kit, it instantly worked (Yay! Getting better at that. ;)) and as I cannot make much noise in my flat, I test-drove it using some impulse response and load box behind my amp. It sounded awesome! But that assessment turned into “Holy f*ck, this sounds frigging marvelous!”, when I used it at my friend’s rehearsal room. Especially on the TS9 setting. It’s exactly the overdrive pedal I’ve been looking for. It adds warmth, but also some grainy, crunchy cream topping. It works perfectly in front of other overdrives to create everlasting sustainy distortion sounds. Here’s a small blues jam from our last Klanghöhle Session. Usage of the TS starts at about 02:05. Another session with the C.L.A., my MOD Duo and my self-made delay plugin. 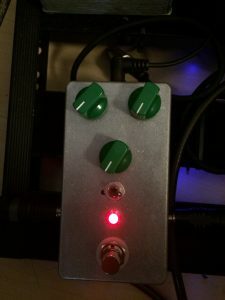 First time, I used my new MOD Duo and my self-made delay plugin in a band context. Ever had the problem of your JTM-45 suddenly starting to howl? You changed all valves, suspecting it to be a case of “microphonia” and that problem is still there? Once I received the parts, I replaced pot and cap and gave it a loud test run. I also tapped against it and everything was eventually working as expected. 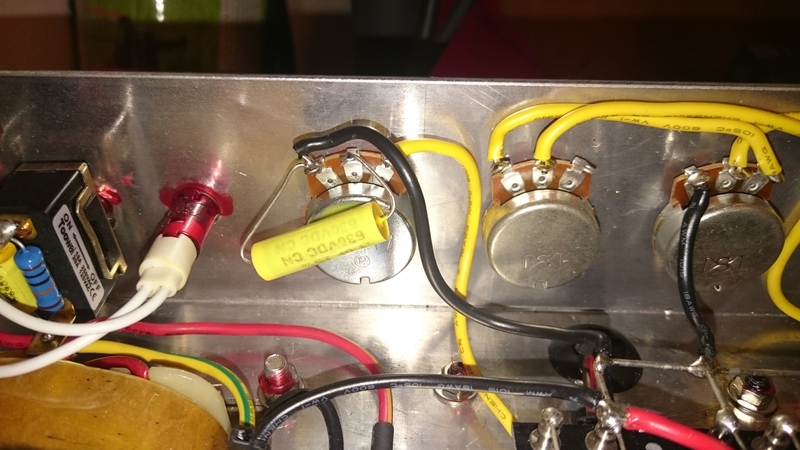 To sum it up: I’ve spent EUR 2.50 and 20 minutes of work and testing to fix it, instead of having to send in the amp to a workshop, costing the amp maker probably a hundred times more money. Von den ganzen Grünen und Gelben mal abgesehen eigentlich recht nett. Dieses Mal den Guiding Bass-Track in Ableton gebaut, dazu Gitarre und Drums eingespielt, anschließend den Bass noch einmal ge-overdub-t. Unsere erste Session mit meinem neuen Celestion Vintage 30.